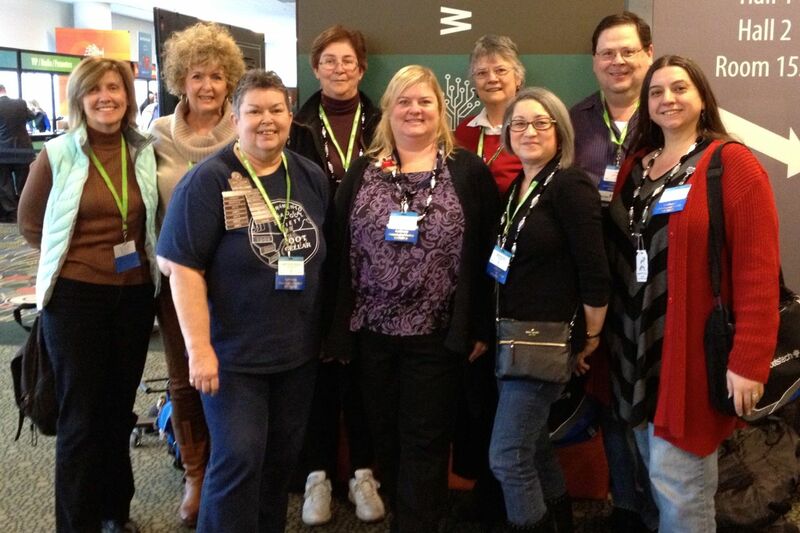 Several members of the California Genealogical Society attended the third annual RootsTech conference in Salt Lake City. Amy Coffin nailed it when she tweeted "So far, the theme for #rootstech 2013 seems to be 'bigger than last year' in every aspect." With more than 6,700 attendees, it was the largest ever gathering of genealogists in the United States. The best thing about genealogy conferences (in my opinion) is the face-to-face. I spend a lot of time in a virtual genealogy world so connecting "in person" with gen-friends and distant members is a real treat. We successfully gathered nine members together for a "CGS photo." Linda Darby, Patricia Burrow, Sandra Benward, Nancy Schlegel, Amy Coffin, Virginia Kysh, Kathryn Doyle, Tim Cox, and Kim Cotton. Missing were Bill George, Gloria Hanson, Paul Hawthorne, Lisa B. Lee, Thomas MacEntee, and Gene Pennington. Next year's RootsTech Conference will be held February 6-8, 2014, in Salt Lake City. Sorry I missed the photo. I'll see you guys at NGS Las Vegas I hope.